My husband’s living will is in his backpack when he checks into the little New England hospital near the lake house where we stay every summer. Not that we are worried. Stu has had mild pneumonia twice before, a side effect of a weakened heart. The slight fever of the night before didn’t stop him from playing Mexican Train with our granddaughter Sara, the white-tiled dominoes standing and falling with their double laughter, her delight being his. It is only the threat of a hurricane, one day away, that keeps us from going back to the lake house with oral antibiotics, as before. “With your heart condition,” the clinic doctor warned, “if you run into trouble and the trees are down, you might not get here in time. Besides,” he added, “IV antibiotics work more quickly than pills.” With a big family party coming up next weekend, “quickly” sounded good, so Stu agreed, and now, a few minutes later, in comes the wheelchair. Stu backs away. “I’ll walk, thanks. I’m fine!” The nurse, a blond with a winning smile, says, “Oh, come on, handsome!” and he climbs on, happily chatting, as she rolls him down the hall that connects clinic to hospital. I stay to fill out forms, and when I get to Stu’s room, he’s already in bed. A dark-haired young man is in the middle of the room, introducing himself. “I’m the hospitalist,” he says in a clipped East Asian accent. “What’s that?” I ask, and he turns towards me. I try to loosen him up with a smile; Stu tries joking about the Red Sox game. No luck. So Stu says: ”Just give him the living will—and the health proxy.” We had started keeping copies in the glove compartment, just in case, so that the list of end-of-life protocols we don’t want—resuscitation, antibiotics, oxygen, forced feeding—would insure death with dignity, Not like my grandmother who spent ten years in a nursing home, blind and senile, because paramedics jumpstarted her heart at eighty-nine. Or like Stu’s aunt who, despite severe Alzheimer’s, had both legs amputated at eighty-six, a week before she died. The hospitalist glances at the documents and gives them back. “So do you want the IV for intravenous antibiotics, or not?” He sounds annoyed. “Mild pneumonia, absolutely. But still I must ask.” He writes something on the chart. What, I find out only later. “What did Dr. R say when you called?” I ask. “I haven’t called yet. Too busy.” This place is almost empty, you jerk. “But he’s expecting your call.” You have time to order extra tests I want to shout, and not to call the doctor who knows Stu’s heart? I resist. This hospitalist has the power, and we have no advocate here. At home in New Jersey, our doctor came every day after Stu’s emergency appendectomy in May. He read Stu’s charts, adjusted his meds, and kibitzed, as the two men have been doing for twenty years. If there was a hospitalist on duty, we never noticed. By evening Stu is feeling more chipper—and eating a cranberry scone that Alan brought. We all like Stu’s nurse, a lively brunette who seems charmed by this upbeat, silver-haired, seventy-two-year-old patient. “Go home. Get some rest! I’m going to sleep,” Stu tells me, and the nurse nods in agreement. So I leave, but when I call in the middle of the night, she tells me, “He’s uncomfortable.” I hurry back, taking the curves of our moonless dirt road as in daylight. “Hi!” I say ten minutes later, as if I always drop by at 3 a.m.
“Hi!” Stu says, with effort. “You’re here.” His breath is raspy and I begin rubbing his back in large circles of rhythm, as I did in 1988, when he was in intensive care for three days after his heart attack. For twenty-two years, we’ve believed the backrubs saved him. “Umm. That’s good!” Stu’s breathing steadies and my fingertips find his spine and climb to his shoulders. “Keep that up all night!” He smiles, and so do I—until he can’t seem to get comfortable lying down. The hospitalist scowls. He doubts that the hospital will admit anyone who is not an emergency, not with the hurricane coming. “Your husband is fine.” And no, he hasn’t contacted Dr. R yet. The sun is up when Alan arrives. His family is going back to Boston—school starts this week—but Alan says he’ll stay awhile. I don’t remember when the questions start. A small catheter would improve the delivery of antibiotics. Do we agree? Of course, if it will help. An intubation would help the breathing. Do we agree? I’m not sure what intubation involves, but yes, of course, if it will help. Stu is having more trouble breathing, and dozes more, but we still believe in mild pneumonia. No one says not to. Words I have pushed away since 3 a.m. suddenly take over: that Stu could die—not in a vague sometime, but now. For years I’ve rehearsed “what if” scenarios, with every thud upstairs, every phone call when Stu travels alone. I never rehearsed what I say in panic to Alan now: “Maybe we should keep Dad here. Maybe we should just make him comfortable. Maybe you should call your sister.” Julie is out west on vacation and mild pneumonia hasn’t seemed worth calling about. Alan nods and we hug each other longer than we ever have, afraid to say more, afraid to weep. I want to be with Stu, feel him close, but they’ve moved him to the other side of a glass window. We are being kept outside, as four medics hover over him with pumps and tubes under harsh lights. 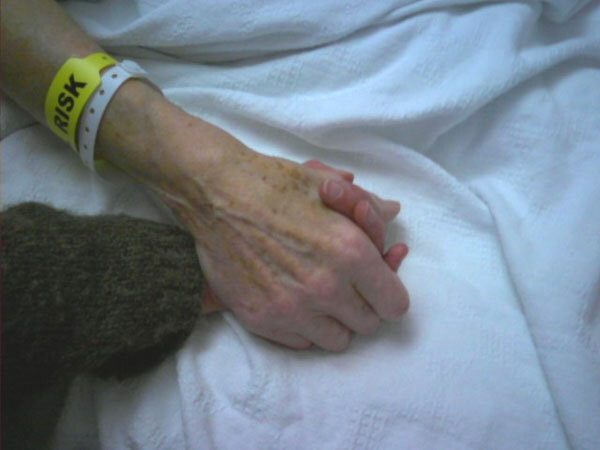 Quick desperate moves that finally push me to ask: “What about hospice care?” The words feel like a betrayal and a gift. I know Stu wants no heroic measures when all hope is lost. But is that now? This hospitalist, this Dr. K_, has offered only optimism, so how can he have Stu strapped on a stretcher about to fly away from me? There is no room left onboard. “But my husband has a living will. It allows us to decide what to do. You saw it, read it.” I try to sound in charge, the way Stu would be. People listen to him, but he can decide nothing now, so I, with his medical proxy, must make his choice. The living will became void, says the hospitalist, when permission was given to treat pneumonia with IV antibiotics. A total misinterpretation, lawyers tell me later, but that was what led Dr. K_ to write “Do everything!” on Stu’s chart. And that’s what the staff has been doing. “My husband wasn’t in crisis; there was no emergency. He just had mild pneumonia. You kept saying that.” No matter. “But it’s a legal contract.” No matter. I feel the voiceless fury of a dream. Stu has wishes and rights to dignity without futile end-of-life measures. Listen to them. Talk to me. No one is paying attention. No one is telling us if his death might be happening or not. Dr. R is waiting to take me to the Cardio Lab. They resuscitated Stu three times with cardioversion procedures, he says softly. “I wanted you to be able to say good-bye.” I try, with growing dread, to be grateful. Young doctors and nurses file out of the lab, leaving Stu and me among the machines, huge and humming. I stroke his hair; he does not speak. I kiss him, talk to him, convincing myself that he can hear me say I love you. That it isn’t too late, that he didn’t die in the air, alone. “We were duped!” I tell my New Jersey internist a month later. She wants to know how I am, and I say that I’m trying to keep busy, not sit in dark rooms. Much of my grief has turned not to tears but to rage at my helplessness on that August day. “All those tests and procedures—and Stu was dead within twenty-four hours.” I feel violated by greed and arrogance. The barrage of hospital bills fuels my cynicism even though I have good health insurance: IV antibiotics, aspirin, echocardiograms, two in-house cardiologists we never saw, and $18,000 for the helicopter that flew Stu north to the big hospital two hours before he died. Or maybe he was already dead. Maybe the little New England hospital didn’t want Stu as a death statistic—and shipped him out. Did septicemia kill Stu? Dr. R suspected it too, especially with Stu’s immune system weakened by the emergency appendectomy three months earlier. Septicemia can move fast, especially in hospitals. Did he catch it there? I never found out because no one in the little hospital ever mentioned the word. Only pneumonia was mentioned as the cause of death. Most hospitalists, I hope, are good apples because 42,000 now practice in American hospitals. We are all likely to find ourselves in their charge when we climb into a hospital bed. Why? The upside is that they are trained to coordinate hospital care and be more efficient. The downside, as Stu and I experienced, is that they don’t know the patients, have no context, and rely heavily on records and tests. If we are lucky, the hospitalist will contact our regular doctor; but collaboration, though highly desirable, is not required. It’s been three years now, and I’ve mostly come to terms with end-of-life issues being messier than Stu and I thought when we signed living wills. And more complicated. Yes, there is a disconnect between ideal and real-time decisions. Yes, people often change their minds at the end of life. And yes, when things happen quickly as with Stu, it’s harder to enforce a living will than when dying is slow and more predictably timed, the way it was for my mother, dying at home of cancer, under excellent hospice care. But one truth remains uncomplicated for me: the right to know what the doctors and nurses know—in real time. How else, living will or not, can we know when mild pneumonia becomes septicemia, and death is no longer a long shot, but close at hand? I said yes to IV antibiotics, yes to oxygen, yes to a catheter—all Do Nots of the living will—because Stu was sick but not dying. He would get well, and IV antibiotics were supposed to speed his recovery, better than antibiotic pills. When did that change? Certainly before the nurses hugged me to say, “I’m so sorry.” Was the hospitalist too afraid to tell me? Too arrogant? Too embarrassed? Too unpracticed in delivering bad news? Or did he really convince himself that our initial yes to IV antibiotics voided the living will and his responsibility to honor it? I still don’t know because I never filed a formal complaint, thinking who would listen? I know no one there. I would write this instead, warning others: be aware. How I missed those words on Stu’s last day. How I wanted someone with expertise and empathy to offer me options, make a recommendation, and then genuinely ask: “Should we make your husband comfortable or fly him to the big hospital?” I imagine myself saying, Yes, yes. Make him comfortable—but, of course, that’s after Stu had died. On that day of fading hope, maybe I would have said, Go quickly! Fly him there. Save him, do whatever it takes to keep him alive. I don’t know. I can’t be sure. But if it were today, the helicopter waiting, I would want to make that choice. And with the right doctor’s help, one who accepts the fog of hope and hopelessness, I would have had enough time for holding hands and good whispers in the private quiet of letting go. Mimi Schwartz is the author of When History is Personal, forthcoming Spring 2018 from University of Nebraska Press, from which this essay is excerpted. She won the Foreword Magazine Award for Memoir in 2008 for Good Neighbors, Bad Times - Echoes of My Father’s German Village. Other books include Thoughts from a Queen-Sized Bed and Writing True, the Art and Craft of Creative Nonfiction (co-editor Sondra Perl). Mimi’s essays have appeared in The Missouri Review, Agni, Creative Nonfiction, Fourth Genre, Calyx, Tikkun, Florida Review, Brevity, The Writer’s Chronicle, among others, and seven essays have been Notables in Best American Essays. She is Professor Emerita at Richard Stockton College of New Jersey and lives in Princeton, New Jersey.